From stylish shopping and decadent dining, to contemporary arts and a vibrant nightlife, Leeds is abundant with things to do, making it the perfect location for your team building event. Embrace the vibrant, northern city of Leeds and consider it for your next Team Building Event. With an array of venues and activities on offer you will be spoilt for choice for your next Corporate Event. One of Right Angle’s offices is based in the centre of Leeds meaning we can give you an “insiders” view on the city itself. Whether that be helping you select the best venue, amazing team building activity or most sought-after places for private dining we are on hand to help you, every step of the way. We offer amazing events in Leeds from our Escape the Box activity to Stop the Clocks, we can offer something for everyone. Just steps from Leeds Train sits the Hilton Leeds City Centre Hotel, a great meeting point for larger events in Leeds. 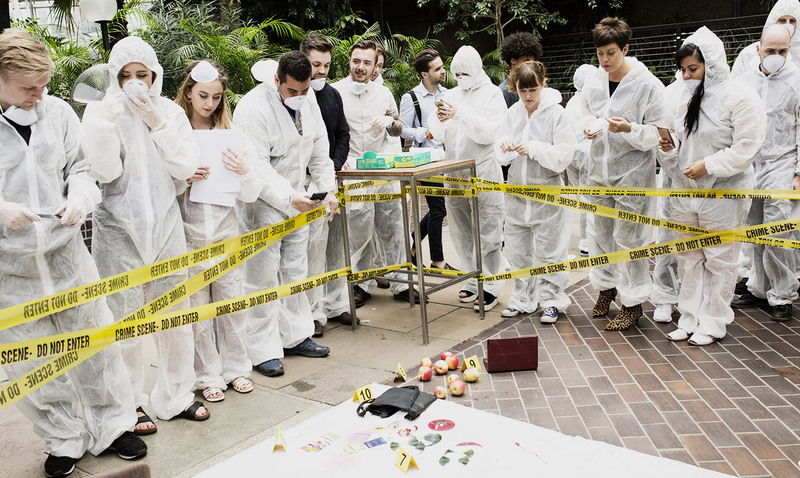 Immerse your guests with the Award Winning Team Building Activities "The Killing", a CSI Experience. No risk rain with our unique indoor team events. From Stocks in the City to The Big Picture. Start your evening with a bang and learn a skill with our Cocktail Making Experiences. Tailored to your team. Adventure around Leeds City Centre with our range of unique interactive Treasure Hunts.